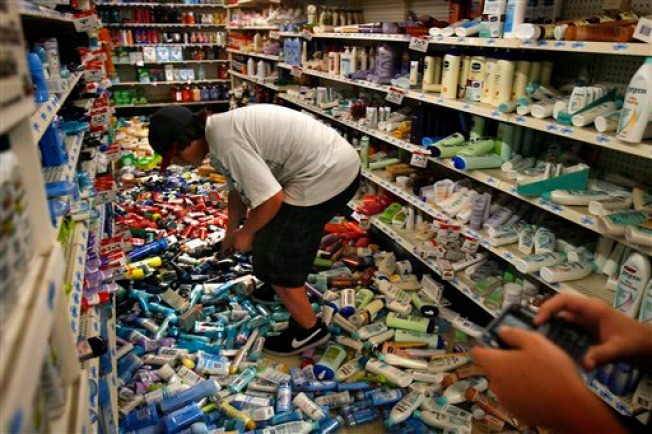 Corey Dixon, 14, sifts through deodorant to purchase from K-Mart during the aftermath of a earthquake near Diamond Bar, Calif. on Tuesday, July 29, 2008. 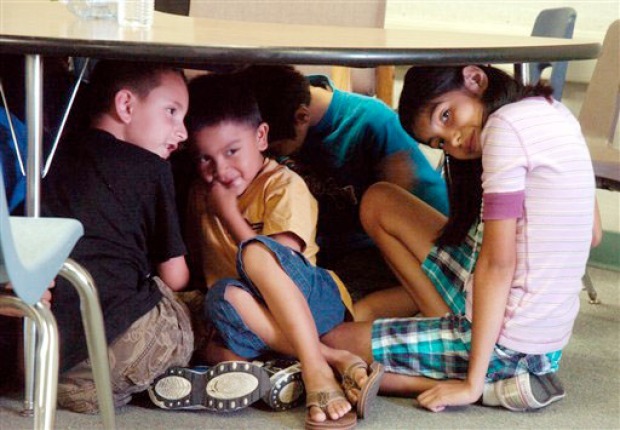 Southern Californians went back to work Wednesday after a strong earthquake shook the region, but the 5.4-magnitude temblor still dominated conversation as residents worried about aftershocks and vowed to step up their emergency preparations. The quake, which rocked the region from Los Angeles to San Diego on Tuesday, caused only limited damage and a few injuries but served as a reminder of the seismic danger just below the surface of sprawling freeways and subdivisions. The temblor's epicenter was located just outside Chino Hills, 29 miles southeast of downtown Los Angeles in San Bernardino County, and it was felt as far east as Las Vegas. Dozens of aftershocks followed, the largest a magnitude-3.8. "We were really fortunate this time," said Capt. Jeremy Ault, of the Chino Valley Independent Fire District. "It's a good opportunity to remember that we live in earthquake country. This is part of living in Southern California and we need to make sure we're prepared." The magnitude-5.9 Whittier Narrows quake in 1987 was the last big shake centered in the region. That quake heavily damaged older buildings and houses in communities east of Los Angeles. As strongly as it was felt, Tuesday's quake was far less powerful than the deadly magnitude-6.7 Northridge earthquake that toppled bridges and buildings on Jan. 17, 1994. That was the last damaging temblor in Southern California, though not the biggest. A 7.1 quake struck the desert in 1999. Derek Black, a 19-year-old personal trainer, said it was the first large earthquake he remembered despite living in the area since birth. Black said he was helping a client do pull-downs at the 24 Hour Fitness where he works when the floor started to rumble. He grabbed onto a weight machine and turned toward the wall, where he saw the quake's shock wave ripple across the floor-to-ceiling mirrors affixed to the workout area. TVs suspended from the ceiling were swinging back and forth as everyone evacuated the gym. Black said although the gym was crowded during the lunch hour, no one was hurt. The mirrors buckled, but didn't break, he said. The heaviest shaking was northwest of the epicenter near suburban Diamond Bar, said Thomas Heaton, director of the earthquake engineering and research laboratory at Caltech. He said all buildings constructed in the region since the 1930s should withstand the kind of shaking felt Tuesday. The earthquake had about 1 percent of the energy of the Northridge quake, he said. Merchandise toppled from store shelves and bricks fell from walls of old-style buildings, local television stations reported. The state Office of Emergency Services in Sacramento received scattered reports of minor infrastructure damage, including broken water mains and gas lines. The damage was in the greater Los Angeles area. "I thank God there have not been any reports of serious injuries or damage to properties," Gov. Arnold Schwarzenegger told a televised press conference. "People understandably are very nervous." The jolt caused a fire but no injuries at a Southern California Edison electrical substation in La Habra, about 12 miles southwest of the epicenter, spokesman Paul Klein said. Damage there and to other equipment led to some power outages in Chino Hills, Chino, Diamond Bar and Pomona, he said. Chino Hills, the quake's epicenter, was incorporated in 1991, so much of the construction is newer and built to modern safety standards, said city spokeswoman Denise Cattern. She said there were no reports of harm in the city of 80,000, although cell phone service in the area was briefly disrupted. Attractions at Disneyland and Disney's California Adventure theme parks and at the Knott's Berry Farm theme park were temporarily closed for inspections after the shaking. Metrolink spokeswoman Denise Tyrrell said commuter trains within a 30-mile radius of the epicenter were slowed to 20 mph until tracks could be cleared by safety inspectors. A ground radar at Los Angeles International Airport was lost for about one minute after the quake, but no flights were affected and the radar did not require repairs, said spokeswoman Nancy Castles. Supervising Los Angeles County Superior Court Judge Stephen Czuleger said 12 of the county's 50 courthouses were evacuated, but only one in Pomona had visible damage -- a crack in the building. No prisons or other state correctional facilities in the area were damaged, and there were no security breaches, Department of Corrections and Rehabilitation spokeswoman Terry Thornton said.